I used to think that the trilobite was merely one of those instantly recognisable fossils, sort of like an elongated and flattened woodlouse. The sum total of my knowledge of trilobites was, in the style of a foot note to a child's introduction to fossils, that they were distant relations of the modern horseshoe crab. Growing up in Birmingham, I'd never seen a horseshoe crab, though on visits to Dudley Zoo, I should have become more acquainted with its older ancestor. 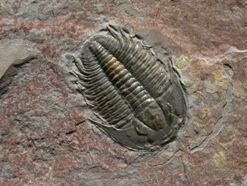 Trilobites are found in vast numbers in quarries around that Midland town, and the 'Dudley Locust' as it was known, features on the town's crest. Richard Fortey's book on trilobites is full of such facts. However it is much more than the sort of history that rests everything on a collection of similar pieces of information. 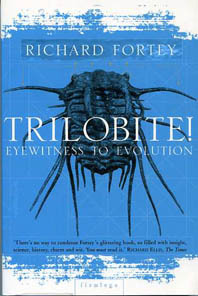 The trilobite forms an important moment in the evolution of life on Earth, and its very success has enabled scientists like Fortey to contribute enormously to our understanding of the history of the planet. The tale is also the tale of Fortey's own career. From his early discovery of a trilobite as a young boy looking for fossils, "other boys discovered girls, I discovered trilobites" to exhibitions as wide-spread as Spitsbergen, Canada and China, his studies of the thousands of trilobite species have led him to be one of those few individuals lucky enough to be pursuing a career in a childhood passion. But Fortey's own interests are much wider than trilobites. Alongside detailed explanations of natural history and planetary geology, his book is peppered with literary quotes and poems. All this makes for a readable and fascinating account. So why are these animals so important. Its not their size. Few of the species seem to have grown more than a foot or so, many of them were a few centimetres in size. Their sheer numbers are stunning. Some of the pictures in the book of enormous quantities of fossils and pieces of fossil, piled on top of each other, are testament to the numbers of trilobites that must have existed on sea bottoms and in the depths of the water. Trilobites were amazingly successful. They came into being when the continents themselves were part of earlier arrangements - before the Pangean super-continent, stretching back millions of years. They lasted for 300 million or so years, far longer than our own species. Its this longevity that in part explains tribolite importance. Mapping out the places that their fossils are found can help identify the locations of ancient seabeds and coastlines. The very movement of the Earth's plates, and hence the continents, around the globe are marked by were fossils of trilobites can be found. There's much more too. Despite the 540 million or so years since they lived, trilobites were not primitive creatures. Their hard shells demonstrate eons of evolution themselves. Able to curl up and protect themselves from predators, or on occasion produce spears and tridents to help get their food, scientists have identified trilobites that roamed the surface, swam in the Cambrian oceans and lived under the mud. A few lucky scientists have made careers from bridging the boundaries of their disciplines. Most trilobites could see, growing crystals of calcite that focused light onto sensitive cells. The very notion of an animal with eyes partially made from the same substance as rocks or shells is stunning, and Fortey devotes a fascinating chapter to the evolutionary and biological questions that this throws up. The trilobite is a humble creature. Fortey says that he has given up hope that there remains a remote ocean-valley holding a still living colony of these creatures. It seems, sadly, that despite the animal's success, it was unable to survive the changing environment. However, the insight that we can gain from its life into sciences as varied as plate-tectonics, genetics and evolution, surely gives this animal an importance far beyond its own humble life. Richard Fortey's wonderful book is a brilliant insight into all of these subjects and far beyond. When I first started reading 'Trilobite' I had no idea what to expect. I've read lots of these sorts of books and figured it would be either dry, or technical, and figured I could handle it and learn something new. What I didn't expect was Fortey's excited poetic adoration of not just trilobites but of the associated archaeology, geology and oceanography that goes along with them. Fortunately I had studied much of the material touched on in the book during my time at university, so scientific terms and Latin names were not an issue and I could move quickly through the book. However, I had no idea about several things, such as that Newfoundland and Wales were once the same land mass. It's bits like this that make Fortey's book so great. People like Fortey are unique. Not only does he have a life-long obsession that he has been fortunate enough to make his life's work, he is also able to convey that love through literature, humour and descriptions that even someone unfamiliar with the material can appreciate and enjoy. Plus, it's not often that an evolutionist uses quotes from the Bible to punctuate his theories! I'm sure that as technology improves and more information is gathered, we will see insights into trilobites and the Ordovician / Devonian for years to come. Now I just have to find some way to bring Fortey's excitement into the classroom when trilobites come up during our science class.